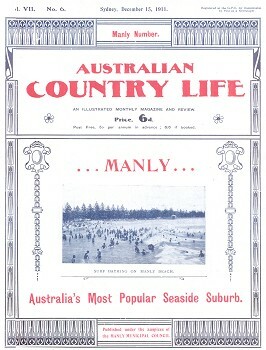 Australian Country Life : Manly, December 1911. Sydney, N.S.W., December 15 1911. Apart from the Manly Swimming Club, located on the harbour side, note that in 1911 four separate organisations were competing for official recognition as surf lifesaving clubs over a stretch of ocean beach hardly more than 1000 metres. 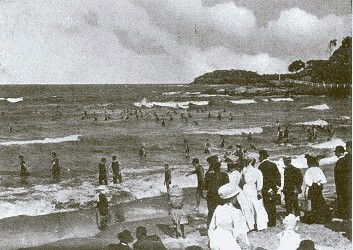 SURF BATHING ON MANLY BEACH (Cover). The Alluring Village of the Pacific Ocean. Where is the AustralIan who has not heard or, if he or she has not actually seen and visited, the most alluring seaside place along the vast coast line of the Pacific Ocean, known by the somewhat strange and singular, but, withal, pleasant name of Manly? If it were possible to search the Commonwealth from its furthermost points north and south, and east and west, probably such a person above the age of youth would not be discovered. The charms of Australia's incomparable seaside resort have been talked of in every city, town and hamlet, on farm and station, and in camp alike. They have been heralded by popular voice over every portion of the Continent, and so amongst Australians Manly is a familiar place even to those who have never had the pleasure of setting eyes upon it. Hemisphere, but the mother State of Australia, the "village" of which we speak occupies a unique site, and one that is unrivalled in the beauty and magnificence of its surroundings. From the mighty cliff- North Head- which forms one of the natural gateposts at the entrance to Sydney Harbour, a stretch of rough sandstone country, covered with a stunted growth of primeval scrub, extends for a couple of miles or so northwards and then connects with a low-lying strip of sand, over a mile long and less than half a mile in width. This low-lying land forms the connecting link between the territory of North Head on the south ,and the mainland on the north, and is washed on one side by the generally calm waters of the harbour, and on the other side- only a few hundred yards away- by the rolling breakers of the ocean. The principal part of the "village" is built upon the sandy isthmus. It is a charming situation, almost foreign or tropical in its aspect by reason of a great growth of trees, and ever-fanned by the ozone and pine-ladren breezes, which bring back the ruddy glow of health to the invalid and reinvigorates the jaded worker. What Brighton is to London, and Atlantic City to Philadelphia, Manly is to Sydney, notwithstanding the existence of innumerable other waterside resorts, within just as easy distance of the metropolis. Without wishing to detract in any way from the undoubted attractions of these places, it cannot be said that they equal those of Manly with its unrivalledl situation, long promenades, beautiful beaches, and perpetual gaiety, to say nothing of the delightful journey across from the city by either water or land. Strike an average, or make a comparison, and the "village" by the sea comes proudly out at the head as the place with the greatest claims as a seaside resort. Hence, no doubt, the common feeling and expression, "There is only one Manly." For those who wish to make the trip to Manly by water, the Port Jackson and Manly Steamship Company, Limited, provides one of the most excellent ferry services in the world. On the other hand, there is an alternative trip by way of North Syndey, Mosman, and The Spit, which affords one of the most enjoyable and picturesque rides by vehicle, motor car or tram, to be obtained anywhere around Sydney. A few months ago the electric tram service was established between the east side of The Spit and Manly, so that with the exception of the crossing of the Harbour in a punt at The Spit, the whole journey from either Milson's Point or Mosman to Manly can be made by tram in comfort. The route of the line traverses, at the outset, the well-known and beautiful Seaforth Estate, comparatively recently sub-divided and sold, and now budding forth as a popular residential suburb. Excellent glimpses of the Harbour, north and south, and the pretty suburb of Mosman are continually being unfolded as the tram slowly travels over its zig-zag course to the top of the tableland, where is shortly revealed a majestic panorama of ocean, harbour, and landscape- a picture that cannot fail to evoke boundless admiration because of its rare character and exquisite beauty. Growth and Prospects of the Town. As a result, of the improved transit facilities offered by the electric tramway, there is already evidence that the progress and prosperity of Manly, great as they have been during the last few years, will be even more rapid and pronounced in the near future. There was a large amount of building in the town last year, when over 150 new dwelling houses were erected. Practically all large tracts of adjacent land have been bought by operators for development purposes; and while some of them have already been sub-divided and disposed of- and in some instances built upon- others are in course of subdivision, and will be offered to the public shortly. Added to its accessibility and pleasant means of communIcation, the great feature of the district- the one thing above all else that has won fame and glory for Manly, viz., its unequalled natural facilities for surf-bathing- gives a value to the town which is beyond computation. In the past these advantages have been a tremendous boon. proportions, and its population has nearly doubled. Instead of a quiet little spot, dependIng mainly upon trippers and holiday makers for its support, it has become an important residential suburb, and is growing more and more so every year, while, at the same time, attracting bigger crowds of visitors than ever. ... of the district has had some effect in bringing about this improved state of things, for built on the very ocean fringe, the equalising effect of the sea on the temperature is felt at Manly to the largest extent. Thus we find it enjoying a warmer atmosphere in winter than inland places near by and it is comparatively cool in summer, because it is constantly swept by the sea breezes. Well-Laid Out and Well-Cared For. The town itself is well laid out, and the long rows and avenues of ornamental trees- planted in the long ago by far-seeing pioneers, and jealously guarded to-day by wise municipal authority- add greatly to its appearance and the comfort of visitors. On its west side, the town is flanked by a splendid esplanade which follows the graceful curve of a pretty beach, and extends along the whole length of the foreshore. An avenue of pine trees effectively adorns the promenade, and here seats are placed in position for the public and the student of human nature will find ample scope for enjoyment and observation. The piers, where the passenger and cargo traffic respectively is dealt with, are located in about the middle of the Esplanade, the main pier being directly opposite the junction of the Corso and the reserve. Many handsome residences have been built along the latter, and also on the heights at either end of the beach, and they add considerably to the beauty of this side of the town. are situated on the eastern side of the Esplanade beach, and are the headquarters of the Manly Swimming Club, whose members also take an active part in the respective surf clubs. The baths are about 80 yds. x 30 yds., with a depth of water ranging to 12 feet, up-to-date diving tower, spring boards, and dressing boxes. The club, which has an exceptionally large number of active members, holds races almost every Saturday afternoon, and a carnival once a year. The baths are thrown open to ladies every day, holidays and Sundays excepted, between the hours of 10 a.m. and 1 p.m. The water is always beautifully clear, and the baths are kept in a clean and attractive condition. A Picturesque and Animated Street. The Corso is not much more than a quarter of a mile long, and is the main artery of the town, and the principal thoroughfare leading from the harbour beach to the ocean. It is a fine, wide street, with a row of trees along its centre, and lined on either side from end to end, with buildings as varied in character and design as the class of businesses conducted within them. The shopping rendezvous of the town and, as we have just said, the chief street leading to the ocean beach, this part of Manly invariably presents a scence of wonderful activity, especially on Saturdays and Sundays, and at holiday times, when it is packed with a crowding mass of humanity, which fills the sidewalks from store window to kerbstone, and occupies the street to an extent that renders vehicular traffic difficullt, and at times impossible. The mass- densely packed, jabbering, smiling, and orderly- ever moves slowly, and, is out to enjoy itself and to take its pleasure quietly. A more cosmopolitan gathering one would not see congregated anywhere else in Australia. ... every civilised country under the sun, and the endless procession formed by the multitude is not the least interesting feature of a day's outing to the village. Manly can justly lay claim to being the leading surf bathing resort in the Southern Hemisphere; probably with the exception of Atlantic City in America, no where will you see such crowds of people in the water at anyone time. Take the beach from end to end, no particular spot can be reckoned as dangerous; certainly there are currents at times, but these shift, and are never in one place for any length of time, and may be absent altogether. protection for the bathers, by the life-savers and volunteer clubs, and to ensure the use of the dressing sheds provided. improvement will be made in this regard. At South Steyne there is accommodation for about 1,000, and at North Steyne, half that number. At both places the Council employs life-savers, who are on duty from 6 a.m. to 6 p.m. daily, and in addition cleaners attelJd to both the men's and ladies' sheds. A lady attendant is employed lt both North and South Steyne. decent costumes and the proper behaviour of all bathers, both on shore and in the water. Promenading in costume is not allowed on the beach, nor are bathers permitted to lie about the sand, but must pass directly from the water to the enclosures, or vice versa. A costume kiosk, or safety deposit, is provlded where, for a small charge, costumes can be secured or valuables taken care of, and in addition a num-ber of lockers are available for those who care to pay a small charge to obtain more privacy, or security for their clothes. At both ends of the beach are volunteer life saving clubs; at South Steyne are the Manly Life-saving Club, and the Sea Gull Life-saving Club. The advent of these volunteer clubs of capable swimmers and life-savers has probably done more to encourage surf bathing than anything else. At the same time, with ordinary care, there is very little danger, but every effort is made to guard against it, and to cope with it when it arrives. There is a casualty room, fully equipped at both ends, and a surf boat is also available when required. Spectacular Water Carnivals are held from time to time, and attract thousands from all parts to witness the greatest surf experts compete in interestIng and novel competitions. The Ocean Beach, stretching for a distance of about a mile in a gentle sweep from north to south, is unquestionably one of the finest within easy reach of the city. With its long line of beautiful breakers incessantly tumbling in lovely fashion on to the sandy shore, the sea presents a dazzling spectacle, but the natural beauty of the ocean front has been made additionally attractive bv the expenditure of vast sums of money in various directions. The whole length of Steyne Reserve, which runs from one end of the ocean beach to the other, is planted with a double avenue of pines, and a splendid asphalt foot walk has been constructed along the foreshores right round to Shelly Beach, an attractive little spot lying about half a mile south of Steyne Reserve. This promenade, lighted for its whole length by electricity, is immensely popular amongst visitors and residents alike, and at week ends and on holidays during the summer season one finds oneself in a perpetual crowd at any point along it, but especially in the vicinity of the surf-bathing spot, at the southern end of the reserve. Surf bathing is a pastime which appeals to mankind. From the youngest to the very aged, male or female, it is equally beneficial and available to all, and at the present time absolutely free of all cost beyond the provision of the necessary neck to knee or Canadian costume. such a hold on the community, as to insure its continuance for all time, with the result that we may expect a hardier and heathier race of young Australians than has ever been hitherto. At Manly, where everyone practically surf bathes, there is a glow of health in the face, a spring in the step of man and maiden, which marks the advent of surf bathing and the open-air life of the beaches. Individual photographs of the Town Hall, Mayor, Town Clerk and eight Alderman, including C. D. Paterson. The Council have built a number of hot salt water bath houses for ladies and gentlemen at the eastern end of the beach, in close proximity to the surf shed's, and as people derive a wonderful benefit from the effects of these baths, it is found that the patronage far exceeds the accommodation provided, and the question of considerably enlarging them is one which will have consideration in the immediate future. A special feature in the preparation of the bath is that the pure salt sea water is pumped direct from the depths of the ocean into the bath itself, and then aerated with steam, the salt water thus retaining all its natural medical remedial properties. Hot salt sea bathing is not only conducive to health generally, but is most efficacious in the relief of all muscular ailments. The baths are in charge of an attendant. As may be inferred from its situation, swimming and surfing are favourite pastimes of the school children, at least during the warm season. Life-saving forms an important feature of physical training, and large squads are trained yearly by the teachers for certificates. Sports and Pastimes : Clubs Amateur Swlmmlng Club. 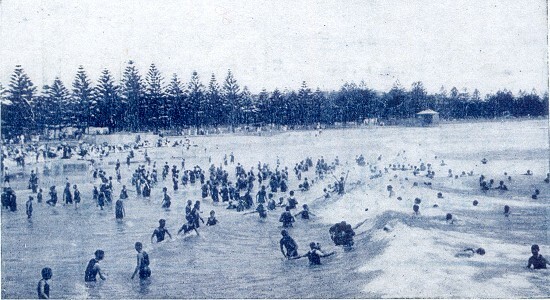 The Manly Swimming Club was formed as the outcome of a public meeting of residents, held in Manly, 21st September, 1905, with the main object of producing a body of athletes proficient in the art of natation and life-saving, whose knowledge and ability would be of use on the Ocean Beach, where surf-bathing was about that time leaping into popular favour, and attracting to Manly people from near and far, many of whom had little or no knowledge of swimming. and not much opportunity of gaining that knowledge in the surf. A GROUP OF SOME OF THE MEMBERS OF THE CLUB. 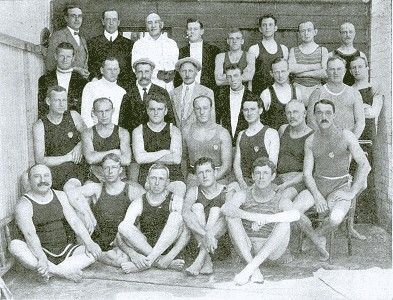 Since that date many changes have taken place in the natatorial world, but the Manly Swimming Club has continued to progress, and is one of the most flourishing organisations of its kind in the Commonwealth. The active interest manifested in it is shown by the large number of entries received in connection with its carnivals. Alreadv this season the club has broken the previous Australasian record entry for the number of starters in any one club race. Prior to this season the record stood at 64 and was held bv the Sydney Amateur Swimming Club but Manly outdone it early in the season with 66 starters in one event, and a fortnight later beat this- its own record- out of sight, having no less than 81 starters in a race. And the members are still hopeful that this number will be exceeded at their annual Christmas carnival, when the big event of the year, so far as the club is concerned, viz., the Christmas Handicap, is contested. Out of a membership of 125, no less than 111 have taken part in swimming races this year, and there are many very fine swimmers amoungst them. It is recognised that the Swimming Club is the nursery of the surf clubs, especIally the life-saving section of those clubs. In the Swimming Club the members meet and race and run as brothers, teach one another the game, and then they come out as rivals in their respective surf club competitions. There is a club-room at the swimming baths, where members do most of their training, and in this respect the punching ball, boxing gloves, skipping rope, polo ball, wrestling, etc., are used a good deal. Starter, Mr. V. G. H. Merrett. Referee, Mr. E. H. Reeve. Hon. Secretary, Mr. H. Austin. 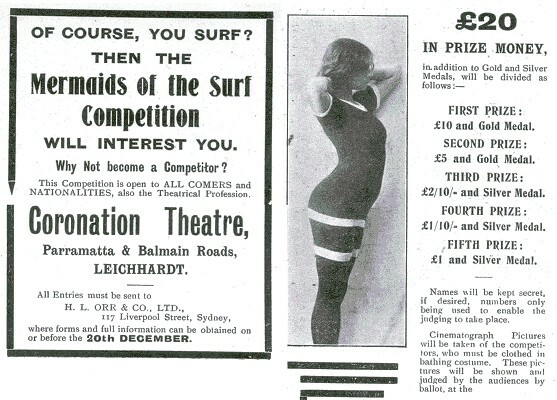 Mermaids of the Surf Competition, 1911. While outside the scope of this webpage, this advertisement has been included for the possible interest of social historians. Vamplew and Stoddart: Sport in Australia - A Social History (1994) page 243. This is the parent organisation of the various surf clubs in Manly, and, as such, it has exerted a great influence not only in popularising the singularly delightful and healthy recreation of surfing, but also in the matter of the improved conditions under which the pastime is indulged in. (d) to effect such other purposes as may hereafter be considered necessary in the interest of the sport. The club has been most successful in achieving the purposes of its existence, and to-day commands wIde support, and occupIes the same leading position it has always held in promoting the interests of the sport, and minimising the dangers of shooting the breakers. 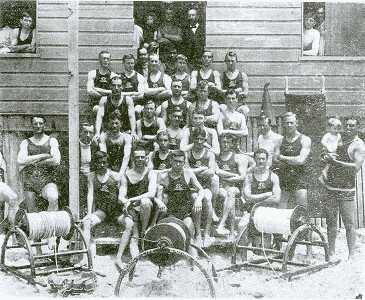 The first life-saving club in Manly was formed under its auspices, and from the ranks of its members, and though there are, as has already been mentIoned, several similar organisations in existence now, many of their members received their training in the art of life-saving in the parent club. His Excellency the Governor (Lord Chelmsford) is patron of the club, and Alderman J. P. Wright, junr., president. There are no less than 36 vice-presidents, including some of the leading citizens in the public, professional, and commercial life of the State, while the committee consists of Messrs. J. T. Easterbrook, A. E. P. Gurdon, H. Ivey, E. W. Kirke, N. Marlow, H. S. Rowe, C. A. Royle, W. H. Palmer, J. S. Richardson, J. D. Pilcher, and L. M. Turner. Captain, Mr. Cecil Healy; vice- captain, Mr. S. C. Jones; captain surf boat, Mr. Stan. Jones; hon. treasurer, Mr. L. C. B, Johnson; hon. secretary, Mr. A. A. Watson; hon. instructor, Mr. G. H. Williams. A surf carnival is conducted by the club every year. It is carried out on a very large scale, and attracts tens of thousands of visitors to the "village." Manly is to have a Water Carnival, the date fixed being January 20. The surprising thing is that Manly has taken so long to decide on a fete of this description. Mosman has been most successful in carrying out water carnivals, and the facilities there are not to be compared with those of Manly Cove. The date chosen is a good one, but why not have fixed it for Anniversary Day, less than a week later? life-saving, as then taught by the Royal Life Saving Society. Since that time, however, rapid strides have been made in all life-saving methods, which have been more particularly adapted to the requirements of the surf. 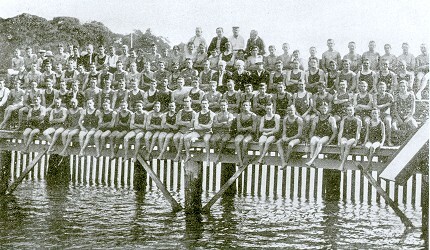 The club, under the active direction of energetic officers, from the very first took a prominent place among similar bodies, and although in the first year of its formation unable to quite "get there," in every subsequent year it has won for itself the honour of the "Premier Surf Club," and only last season, out of the nine Rescue and Resuscitation events which it entered, it won seven. As a result of the prowess displayed by members, the club room is decorated with trophies, among the more important of which are Begg's Shield, valued at 80 guineas; West's Pictures Shield, the Quaker Oats Cup, and numerous smaller ones. The North Steyne Club was the first to introduce a standard of efficiency among the members, and this proved so successful that the practice was adopted by the Surf Bathers' Association, as the lines on which they make their surf award. Financially the club's success has been phenomenal. Depending alone on the subscriptions of members and a few donations, the club has annualIy held a carnival, which is usually acknowledged to be the best organised of any of that nature, and each one has resulted in a very substantial addition to the club funds, and these funds have been expended in providing life-saving gear and equipment, as well as first-aid appliances and a comfortable club room for the active members. Some time ago the Council were good enough to erect a small room for their use, but as this was found insufficient for requirements, the club, at its own expense and with the aid of the members in working bees duplicated the accommodation, and filled up the room in an up-to-date manner. committee, Messrs. W. J. Allison, A. T. Currie, P. H. Cameron, R. N. Beale, W. C. Fisher, L. Glen, and H. Taubman. This Club also saw the light of day for the first time in September last; but already it shows a vigorous growth, and affords outward and visible signs of a successful institution. A condition of membership of the Club is that a man must hold a certificate either of a Royal Life Saving Society or the Surf Bathers' Association. The Club offers every opportunity to those who do not possess either of these awards to qualify for membership, as it undertakes to prepare them for the tests at its own expense, the only condition being that one or other of the awards must be gained by each member within three months from the time of his initiation. At preseot 80 per cent of the members of the Club hold the awards of the Royal Life Saving Society and Surf Bathers' Association, and three members have won recognition at the hands of the Royal Shipwreck Relief Society for conspicuous bravery displayed in the saving of human life. Captain-of Surf Boat, Mr. F. Notting. The Manly Seagull Surf and Life Saving Club. The Manly Seagull Surf and Life Saving Club, born on September 11 last, is, as yet, only in its swaddlillg clothes, but the body is a veritable picture of health and vigour, and promises to develop into a strong, active, and serviceable organisation. At the start there were only 15 members on the roll, but this number has already grown to just on 100, and is being further increased every week. speaking of it as "our own' club. or vice versa." - page 10. 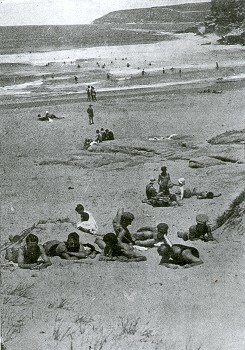 Sun-Baking, Surf-Bathing, and Camp Life in NSW, 1908. Australia's Most Popular Seaside Suburb. Geoff Cater (2008) : Australian Country Life : Manly, December 1911.